My wife and I are fortunate to have a 2nd home in Cape May and we absolutely love our 'Katie's Sun Cottage'...named after our daughter Kaitlyn...This home is meticulously maintained and has been in operation as a rental since 2003. The proximity to the beach is a short 3 blocks to 'Philly Beach' and you can hear the waves from the front porch (which has rocking chairs for 3 and kids chairs). If you are looking for a relaxing vacation in a home that has everything at your fingertips, this may be the place for you. Every time we enter the town and drive over the bridge, a feeling comes over us that takes away any stress we may have. The house is 3 levels and has 6 bedrooms, including one attachment room to the master bedroom. The home is suitable for 3 families and children and can sleep 10 to 12 comfortably and up to 14. 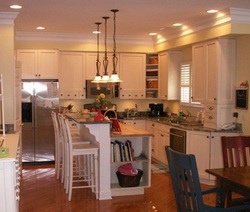 The property is maintained year round by a landscaping company and you can expect a fully equipped kitchen for cooking. Why the Owner Chose Cape May: We love spending time in Cape May. We were married there and just love this charming town. Spending time in Cape May is a throwback in time. Truly a wonderful place for a family vacation.